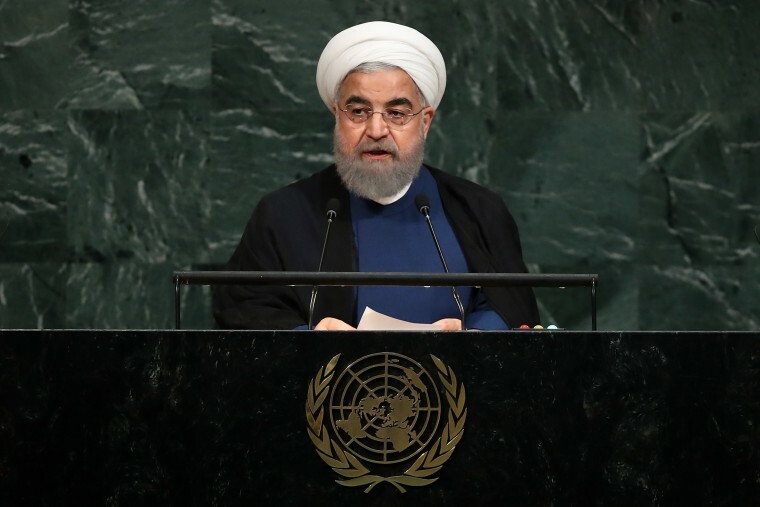 Iranian President Hassan Rouhani on Wednesday ripped President Donald Trump’s speech to the United Nations General Assembly a day earlier as “ignorant, absurd and hateful,” charging that it would be a “great pity” if the 2015 nuclear deal his nation agreed to with the U.S. and other world powers “were to be destroyed by rogue newcomers” to politics. In a scathing 23-minute speech to the chamber, Rouhani did not mention Trump by name, but referred to him on several occasions, citing his threats to tear up the nuclear pact. “It will be a great pity if this agreement were to be destroyed by rogue newcomers to the world of politics," Rouhani said. "The world will have lost a great opportunity, but such unfortunate behavior will never impede Iran’s course of progress." He also took specific aim at Trump’s controversial speech to the chamber on Tuesday. Trump blasted the Iranian government as a “murderous regime” focused on the “pursuit of death and destruction." In criticizing North Korean dictator Kim Jong Un, Trump said, “Rocket man is on a suicide mission,” and warned that the U.S. may be forced to "totally destroy" the rogue nation. It was Trump’s comments on Iran, however, that captured the attention of Rouhani, who had told NBC News Tuesday that if the U.S. backed out of the nuclear deal “no one will trust America again" and that his country could then resume work on expanding its nuclear capabilities. Trump, for his part, said earlier Wednesday that he’d made up his mind regarding whether he would end the deal, but wouldn’t say how he’d decided. During a photo op with Palestinian Authority President Mahmoud Abbas, Trump was shouted a question about the deal. “I have decided,” he responded. Meanwhile, Trump spent much of Wednesday huddling privately with Middle Eastern leaders on the sidelines of the assembly. Next, before his meeting with Abbas, Trump said he was “fighting very hard” for a peace deal between the Palestinians and Israelis.